Get movie theater style popcorn from the comfort of your own home with the Superior Popcorn Company 20 Oz. 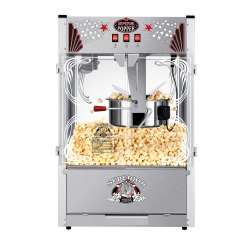 Tabletop Popcorn Machine. The set comes with the popcorn maker, kettle, scoop, salt shaker, measuring cups, 50 paper bags, 3 popcorn buckets. It is easy to use and features 3 switches (pot heater, stirrer, warmer) to help ensure delicious, fresh popcorn in every bite. The machine has small perforations and an old maid’s drawer underneath which helps to catch unpopped kernels and makes it easy to clean up after use. 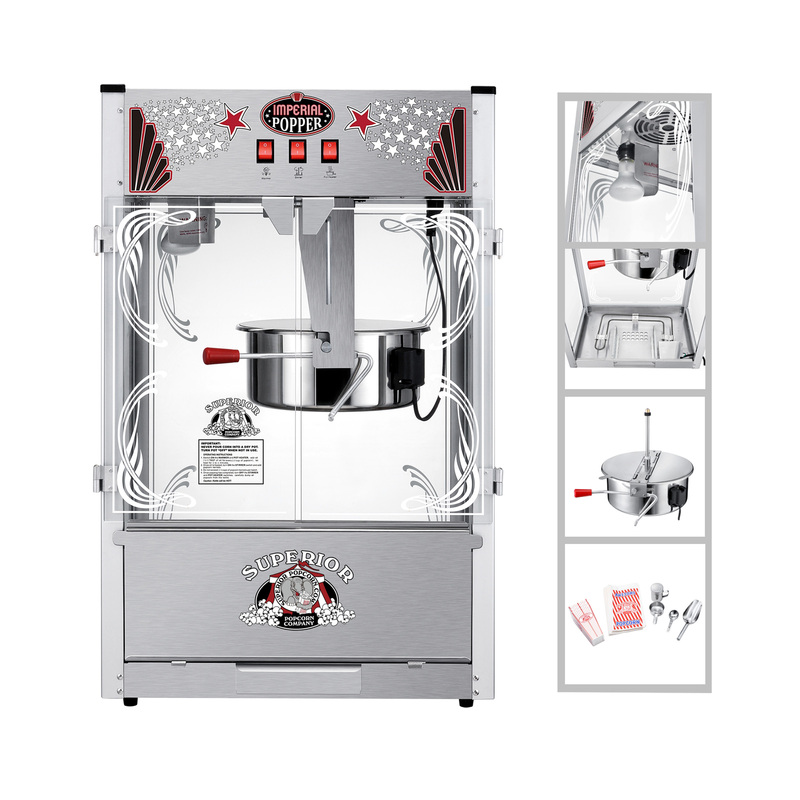 It captures the vintage, nostalgic charm and style of antique machines, but with convenient modern features. It is made from quality stainless steel and glass for long-lasting reliability and is perfect for movies at home, parties, or any other occasion! 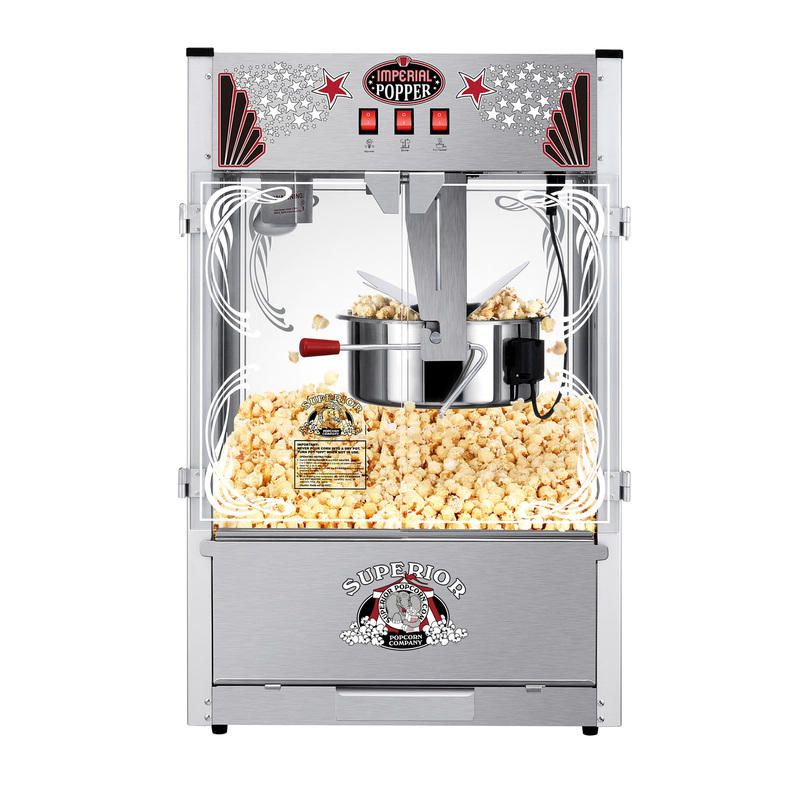 FRESH POPCORN- This countertop machine makes it easy to have fresh kettle-style popcorn at home! 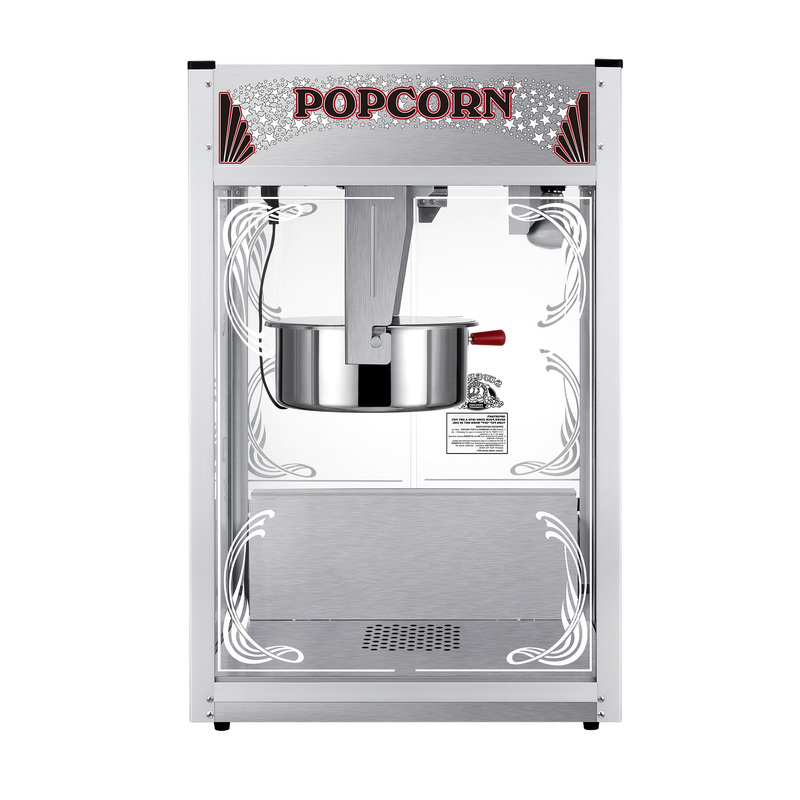 There are 3 convenient switches (pot heater, stirrer, warmer) to make popping fast and simple- and help ensure your popcorn stays fresh and delicious. 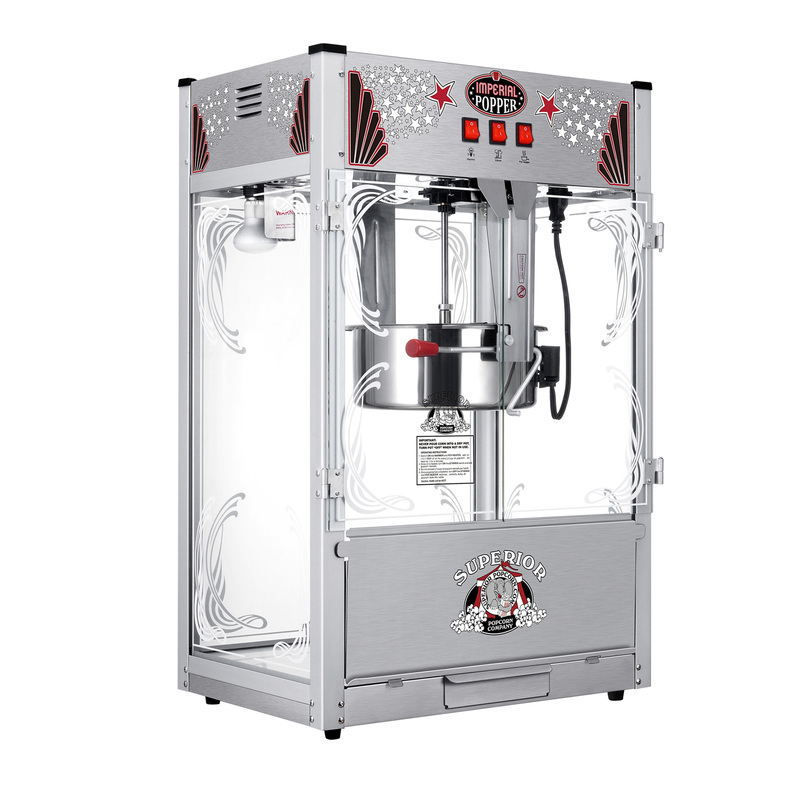 QUALITY CONSTRUCTION- Made with quality stainless steel and glass windows, this popper offers long lasting reliability and an attractive design aimed to capture the nostalgic vintage charm of the antique machines. It can make up to 7 gallons of popcorn. INCLUDES POPCORN MAKING ESSENTIALS- This set has everything you need for a successful at-home movie night or party! It comes with the kettle, 3 buckets and 50 paper bags for popcorn, a scoop, salt shaker and measuring cups in addition to the machine. EASY TO CLEAN- The tabletop popcorn maker has small perforations along the bottom of the machine with an “old maid’s drawer” underneath. The holes allow small pieces of popcorn and unpopped kernels to fall into the tray for quick and easy clean up. PRODUCT DETAILS- Dimensions: 22”x 15” x 33”. Watts: Total 1700W, Light 60W, Pit & Motor 1540W. Material: Stainless Steel, Glass. Kettle: 20oz, power line: 390mm. Includes: machine, kettle, 3 buckets, 50 bags, scoop, salt shaker and 2 measuring cups.